Think about the location, if the prevailing winds usually blow rain in a certain direction then place the logs in an area that it as sheltered as possible; remember to always place them on a flat and stable surface. Don’t place log stacks under trees as these will drip water down and also avoid low lying areas which can be prone to dew, mist or fog. Never just dump the logs in a heap (especially on grass) as they will get wet and be useless; careful stacking will pay dividends in the long run. Preferably, logs should be placed on wooden pallets as these keep them off the ground and provide a free flow of air underneath; the ideal height of the wood stack (including the pallet) should be no more than 3ft (1m) as the logs can become unstable if piled too high. Remember to leave a good amount of space between your logs and any wall, fence or shed to help with air circulation, a gap of about 4” (10cm) all round is ideal, remember also that a log pile is a potential fire risk so consideration should be made to its placement. Although logs can be left in the open they do benefit from the extra protection of a cover or dedicated storage area. Never cover your logs completely with tarpaulin, this will create a seal to stop the air circulating round – ensure the sides stay uncovered for proper ventilation. 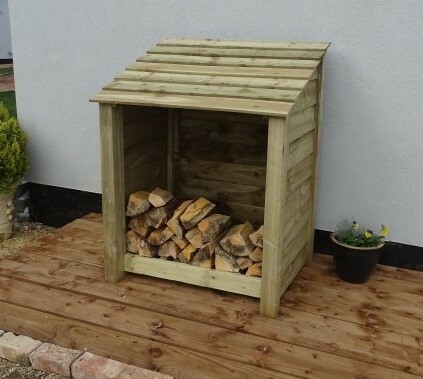 An extra effective defence against moisture is to use a dedicated wooden log store, many of these feature a raised floor and a slanted roof to help protect the firewood. Usually the front is left open; although this can cause problems with hard driving rain, however you will usually find that it is only the front face of the logs that get wet and these will soon dry with the natural action of the wind and sun. A relatively new method of storing firewood but definitely an effective modern approach. These products offer fully enclosed protection, importantly they raise the contents off ground level and feature multiple vents to ensure free flow of air. Ensure you use one that is fire-resistant, maintenance free and has good resistance against corrosion – premium metal log stores offer a 25 year guarantee which is ideal. 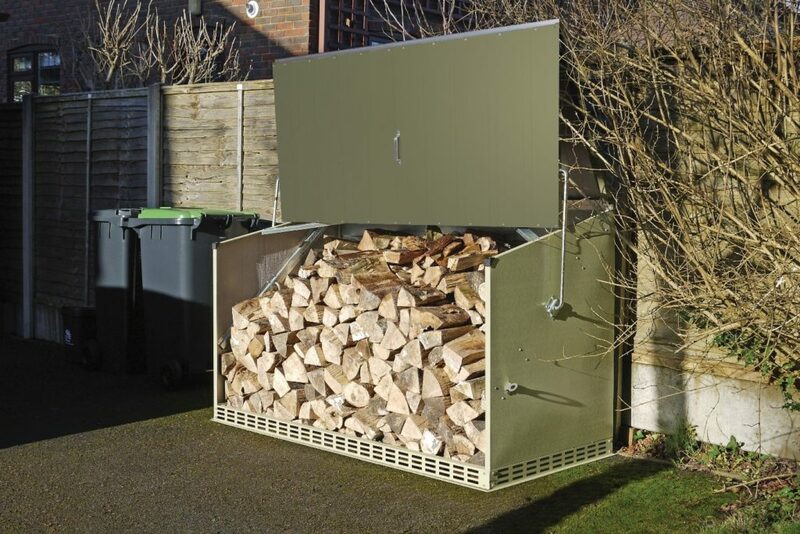 There are a number of solutions to practically, conveniently and safely storing your logs outside. Lastly, remember that damp, unseasoned, freshly split or “green” firewood is almost impossible to light and keep burning; if used in a log burner most of the heat energy will be used to dry the logs and the residue from damp logs will coat your chimney in tar and blacken the glass window in your wood burning appliances.